Line Tool Company Rotary Stages are very hard to find. 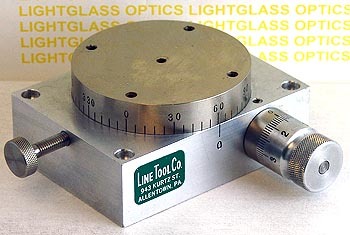 The Model 109 is a compact unit, with the table diameter measuring 2-3/8 inches. The table is drilled and tapped with 6-32 holes in 4 places, with 2 inch separation between opposing holes. This solid little table has full 360 degree rotation and the adjusting knob is graduated in 5 minute increments. It utilizes a precison worm gear for rotation.